This is the text of a leaflet Socialist Alternative is distributing in New York City. Opposition to the Amazon deal is growing and the company is now threatening to pull out. We need to take urgent action against this attempt to bully working people for corporate welfare. 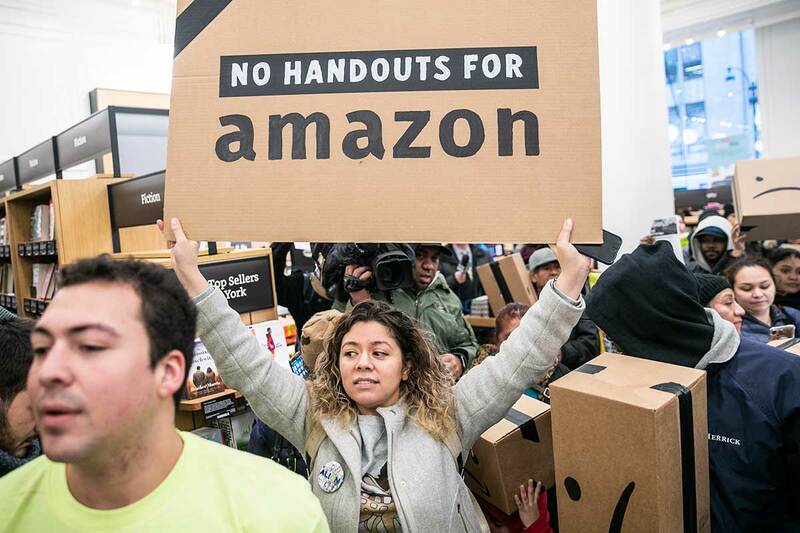 Amazon, one of the biggest corporations on the planet with $1 trillion in annual revenue, does not need a handout from working-class tax payers. Mayor Bill de Blasio and Governor Andrew Cuomo have promised Amazon $3 billion in public funds for 25,000 jobs in Long Island City, at $120,000 per job. By Amazon’s own admission, they chose New York for its “unique talent.” The deal was negotiated in secret and designed to be rammed through with little input or oversight from lawmakers or the public. The wheels now seem to be falling off. The new Democratic Party leadership in the State Senate has appointed Queens Democrat Michael Gianaris – the most vocal opponent of the deal – to the Public Authorities Control Board. This five member agency must unanimously approve the project, and the appointment of Gianaris raises the possibility it will be vetoed. In response, Amazon executives have threatened to pull out of the deal! Cuomo and the corporate establishment is using this threat to whip up an atmosphere of fear to push back against the opposition. Despite Amazon’s threats, this deal should absolutely be blocked. When the subway is broken, NYCHA is in criminal disrepair, and homelessness is at crisis levels, billionaires should not be looting the public treasury. If this powerful company will only invest in cities with handouts from taxpayers and poverty wages for workers, then it’s a clear sign we need an alternative approach to creating good jobs. Cuomo does not not have an alternative, and instead is totally committed to doing the bidding of Amazon and big business. Proposals from Alexandria Ocasio-Cortez and Bernie Sanders point in the right direction, specifically major tax increases on the rich and a Green New Deal to create tens of thousands of good unionized jobs to transition the economy to renewable energy. In New York, we should immediately tax Wall Street to help fully fund public services, affordable housing, the MTA, NYCHA repairs, and more, and create good jobs in the process. According to Forbes, there are 71 billionaires living in New York worth almost $500 billion – they can afford to pay more in taxes too! New York is not the first city to be bullied by Amazon. When the Seattle City Council proposed a small tax on Amazon last year, the company responded by threatening to slash 8,000 jobs! We need an effective counter threat. We need to campaign for taking Amazon into public ownership, along with the biggest 500 corporations including Wall Street banks, big oil, among others, and place them under the democratic control of workers and the public. On such a basis, we could develop a democratic plan to meet the needs of working-class communities. Resources and the most modern technology, which today are used to make a handful of individuals obscenely wealthy, could instead be used to shorten the workday without any loss in pay for workers, while sharing out the work to create tens of thousands of good-paying jobs. In reality, the Amazon deal is the logical development of decades of policies designed to prop up the rotten and dysfunctional system of capitalism. What is different today, and makes this tax break so controversial, is the growing anger of working people. For those who are opposed to the deal, the appointment of Gianaris has raised hopes that the deal is finished. But there are no guarantees that his appointment will be enough. At the time of writing, Cuomo still needs to approve the appointment, and the establishment has not given up. Gianaris has correctly said the deal should be scrapped, but he has not exactly committed to vetoing it. He told the New York Times, “It’s hard for me to say what I would do, when I don’t know what it is I would be asked to opine on” (2/4/29). In 2017, Gianaris signed a letter encouraging Amazon to move to the city. His opposition now reflects the growing anger of working people with corporate politics. Even if he is fully committed to stopping this deal now, a mass movement of working people is urgently needed to counter the enormous pressure of Amazon, Cuomo, and the establishment. We need to call on Gianaris to hold the line. He must block this deal and set clear conditions for any future deal. This includes opposing all handouts and redirecting public money to housing, education, and transit. Any new deal should be subject to a real democratic review by an elected committee, made up of a majority of representatives from unions and affected working-class neighborhoods with the power to change or veto the deal. Gianaris and City Council members have largely relied on the courts and the state bureaucracy to stop the deal. Working people cannot rely on these establishment institutions – or the Democratic Party itself, especially when many Democrats are beholden to Cuomo. Working people ultimately need need a new party. More immediately, mass demonstrations are needed to bring out the full breadth of opposition to the Amazon deal – particularly from diverse working-class communities who will be disportionately affected by the rising property values triggered by the deal. Labor and left leaders should immediately set a date for a united mass demonstration and systematically build for it. This could prepare the way for an escalation of further mass action if needed. Many community groups are making enormous efforts to defeat the deal. Immigrant rights groups have pointed to Amazon’s nefarious collaboration with ICE’s crackdown on immigrant communities. Recently, Teamsters District Council 16 joined the Retail, Wholesale and Department Store Union in denouncing Amazon for it’s atrocious record on workers’ rights. The fight against handouts needs to be linked to support for warehouse and tech workers’ right to a union. Unfortunately, labor is not united on the Amazon deal. Many public-sector labor leaders support Cuomo and are unlikely to mobilize against him unless challenged by their membership and the public. There is a vital interest for workers to do so. If the state is giving tax breaks to Amazon and big business, then there is less money for transit, teachers, public services, and the like. A campaign is needed inside the labor movement to push for union leaderships to completely break with Cuomo and help build a united mass movement of all working people against big business. In the meantime, community groups should keep the pressure on the politicians through smaller actions, while also making public appeals to labor and left leaders to unite against the deal and put their full weight into major mobilizations. If the Amazon deal is defeated, it will strengthen the ground for further struggles around union protections, the state rent laws, funding NYCHA, the MTA, safe staffing, passing the New York Health Act (Medicare for All legislation in Albany), fighting low pay, and more. Even if the Amazon project is vetoed, the policies that provide tax breaks to big corporations – and loot the public treasury – will still be on the books, unless we link this fight to a broader struggle of working people against the failed policies of the establishment and the billionaire class. The fight against this Amazon deal can be the start of a new era of working class power. Join the fightback! Scrap the handouts to Amazon! Fund transit, education and housing – not corporate profits. No deal without a real democratic review that gives the community and workers the right to veto or change it. Build united mass protests to demand Democrats block the deal. Tax Wall Street and Big Business. Create thousands of good union jobs to fix the MTA and NYCHA, and transition the economy to renewable energy sources. Close all pro-developer loopholes in the state rent laws. Pass universal rent control statewide. Support tech workers, Amazon warehouse workers, and all workers’ right to a union. Unite against racism, sexism, and attacks on immigrants. For the unions to break with Cuomo and help build a united movement against big business. Build an independent working-class movement and a new party to fight for socialist policies that put people before profit.